SOPHIE HEWITT, a second-year Laws/Asia-Pacific student at ANU, reminisces about her semester in Indonesia and her experiences with the world-renowned UNPAR University Choir. Every returning exchange student gets bombarded with questions: ‘How was exchange?’ ‘Are you glad you’re back?’ ‘Did you get homesick?’ As vague and broad these questions are, probably the worst question is, ‘what was the best part?’ How on earth can you choose one single moment that narrows an entire six months into one single experience? While it’s unfair to categorise your exchange from best to worst, I think there is an indicator for what your most valuable experience is: the thing you miss most when it’s over, was probably your ‘best experience’. After having various bouts of food poisoning, spraining my ankle, having flights cancelled, homesickness and general confusion about Indonesia’s transport situation; my worst moment in Indonesia was when I arrived home after my choir concert. I felt miserable because the rehearsals and performances which gave me so much joy could never happen again. For the first six months of 2015 I studied at Universitas Katolik Parahyangan in Bandung, Indonesia. I studied at UNPAR through ACICIS (The Australian Consortium for In-Country Indonesian Studies) on a New Colombo Plan Mobility Grant. This program was targeted at teaching Australian students about Indonesia’s perspectives on international relations as well as cultural and language immersion. It was here that I joined Paduan Suara Mahasiswa UNPAR (PSM UNPAR): the university choir. As an internationally renowned choir, they have competed in and won various international choir competitions in Europe, as well as national Indonesian competitions. Their repertoire is intense: as well as the majority of songs being in English, the students’ second or third language, other songs were in French, German and Latin. The songs are technically difficult with key changes, unusual timing, complex dynamics and eight-part harmonies. Understandably, the obligatory annual auditions are a constant fear for most members. To become a member of PSM UNPAR is a relatively lengthy process. The first step includes two months of rehearsals (two hours per day, five days per week) and then an audition of those pieces. If you pass the audition, rehearsals for the final two months require attendance four hours per day, seven days per week. If you miss too many rehearsals, don’t tell the conductor you’ll be absent, arrive late, or forget your music, you will be fined. (While the fine was only the equivalent of AUD$0.40, it still made me very nervous). The purpose of all this rehearsal is to perform at the Internal Concert which was comprised of 20 songs, two costume changes, choreography and standing still in stilettoes for long periods of time. If you survive all this, you’re a life-member of PSM UNPAR. 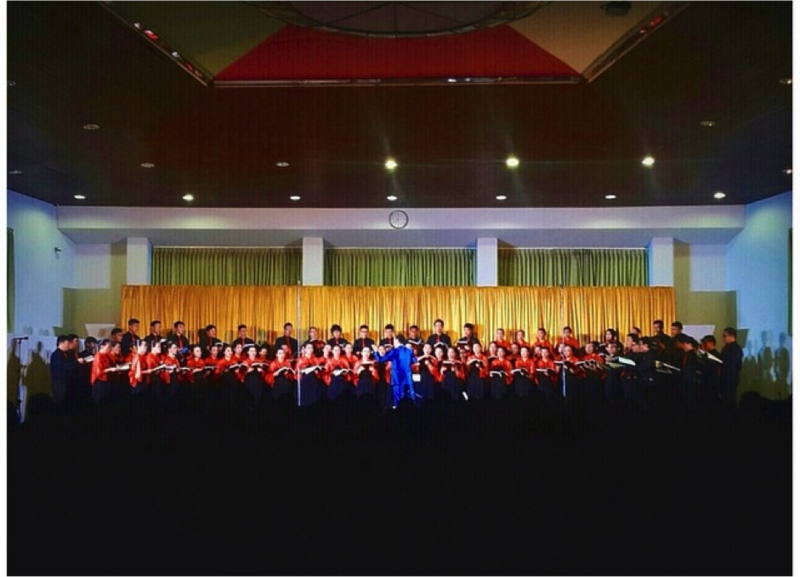 PSM UNPAR at their Internal Concert, Bandung, 2015. PSM UNPAR taught me invaluable language skills. While I study Bahasa Indonesia back in Australia, it cannot compare to the language skills you pick up in country. When I first arrived in Bandung, I was extremely hesitant about speaking Indonesian because I was shy and embarrassed about making mistakes. However, because all instructions in PSM rehearsals were in Bahasa, all online communication was in Bahasa, and most of the members’ jokes were said in Bahasa – I was forced to absorb informal language structure, vocabulary and Indonesian accents. And when there were things I didn’t pick up, I just became much better at guessing. In addition, all members were extremely forgiving and generous when I tried to speak or message them in Bahasa. Thus through their patience, I was able to gain a deeper understanding of the language and build my confidence in my conversational skills. PSM also gave me valuable friendships. As I’m sure other exchange students have found, the people you meet on exchange influence how much you enjoy your time there. As with anything which is long, difficult and tiring, the group in which you do it with inevitably become your friends. I also believe these friendships are testament to the caring, happy and welcoming nature of the choir members I met. In fact when my mum visited me in Bandung, she commented that the choir members ‘looked much happier than Australian university students!’ Whether they’re more welcoming or not, the choir environment was conducive to making friendships. Because I was the first ‘bule’ (white person) to join PSM and did so alone, it obviously forced me to extend myself and make more friends than I otherwise would have. To be fair, there a probably other ways to discover what your best experience was. For example if you felt irrationally angry when it snowed in Canberra in July (as I did), you probably thoroughly enjoyed the weather in Indonesia. If you look at Australian food and think everything looks too fresh and vitamin-rich (as I do), you probably enjoyed Indonesian food. If you have downloaded your Indonesian choir’s songs onto your iPod and listen to them every day (as I do), you probably enjoyed your Indonesian choir. Because exchange is a mixed-bag of weird and wonderful experiences, future-exchange students should take-part in every experience they can. While it’s difficult to choose one thing as your defining ‘best experience,’ I think it’s telling that even when a fantastic experience is over and you feel that loss, the memories are so rich that’s it’s almost like you’re back on exchange again. Almost.